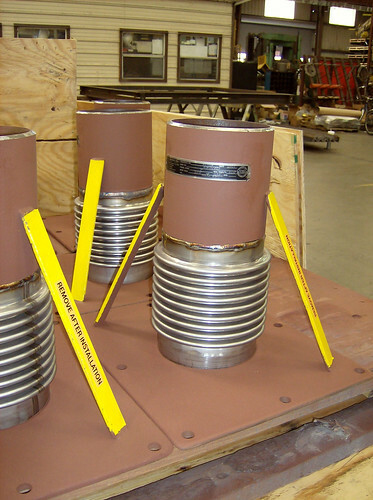 U.S. Bellows, Inc. designed and fabricated 605 single expansion joints with a rectangular plate flange and a weld end. The expansion joints are 6″ in diameter and have an overall length of 15 3/8″. The design temperature was 525°F and the design pressure was 1 PSIG. Each expansion joint was 100% dye-penetrant tested and air & soap bubble tested. The expansion joints are to be installed in a heater for a delayed coker unit.